On a great location in the cosy village Brixen im Thale, next to hotel Sport, you will find apartment 'Edelalm'. 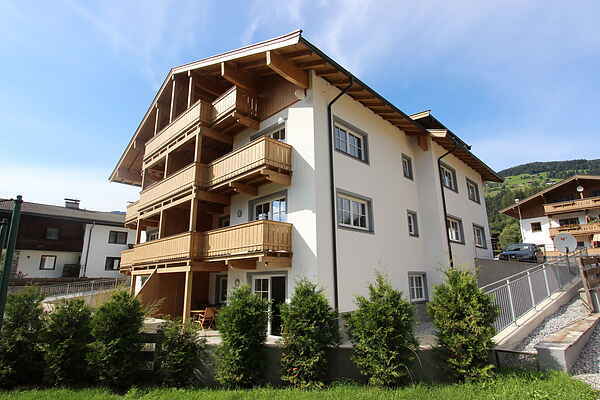 A spacious apartment in the small complex \"Residenz Edelalm\", newly built in 2016. The gondola lift, which is connected to the skiing area \"SkiWelt\", lies only a few minutes away by car; you can get on and go towards the Westendorp area, or the other way to Hoog Brixen. The ski bus makes a stop almost right in front of your door. The \"Tanzer\" descent (1c) ends a few dozen meters opposite the apartment. In the direct vicinity of the house are plenty of restaurants and shops. The apartment is situated on the first floor and can be reached by lift. Through the spacious hallway with wardrobe, you have access to three large bedrooms and two bathrooms. The light living room with a fully equipped open-plan kitchen has a large, cosy sitting and dining area. Along the entire back side (facing south! ), you can find a spacious, sunny balcony with a sitting area and a stunning view across the Choralp.